1) Without direct access to Navisworks Manage, we couldn’t get updated reports, and the old reports were out of date almost immediately. We needed to use the immediate access of good old fashioned Revit Interference Check. 2) Finding and orienting oneself to the model during a web meeting is… challenging. As a means of addressing the major clash items, we devised a workflow that made the issues to review more cohesively apparent, and easier to get right into where the problems were. Elements were found by ID, and CLASH entered into their Comments field. NOTE: I’m wondering if @BoostYourBIM could create an API macro for this part of the process…. Filters were created by category, color coding the elements with CLASH data. This enabled us to SEE the whole set of clashing items at once, rather than using the interference report and ‘show’ to review them one by one. 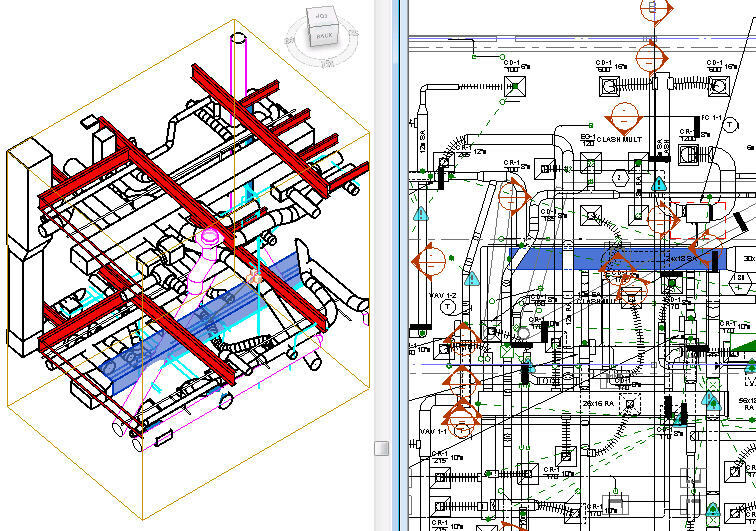 We were able to see where whole SYSTEMS and BRANCHES were needing adjustment, rather than just individual parts. This meant better understanding, and better grasp on approaches to resolve. For better visibility right down into the fray, prior to the web meetings we set up a series of sections to look at specific junctions in the building, and then opened our color-coded 3D view and ‘oriented to view’ to each of the conflict zones. This saves a TON of time trying to grab those frustrating section box handles, and lets you work systematically down a prepared list of areas to review. We kept a plan view open tiled next to the cropped 3D view, so elements selected in 3D would highlight in the plan, and people would immediately know where in the building they were. This entry was posted in Architecture, BIM/Revit and tagged ClashDetection, ModelReview, ModelStrategy, ProjectManagement, Revit. Bookmark the permalink. Instead of creating in-necessary Revit apps why not look at other collaboration technologies instead of relying on Navisworks Manage? As you are using Webinars to discuss clashes, etc. perhaps you should look at using 360 Glue or Cadfaster or some other web based collaboration tool that can do the same as Manage. JJ the point of the post was how NOT to reply on any external program to make identifying clashes and cross-discipline communication easier.